If you drive in the West, you can’t help but notice how much land is protected as national forests and national parks. We get to enjoy the majesty of millions of forested acres, and we take it for granted that our ancestors had the foresight to make sure this land was preserved and set aside for public use. But if it weren’t for Teddy Roosevelt and his friend, Gifford Pinchot, the forest land of the United States might have suffered the same fate as the world’s decimated rain forests. Roosevelt bonded with the West in the mid-1880s. On Valentine’s Day, 1884, when he was 24, he lost his mother to typhoid fever in the morning and his wife to Bright’s disease just a few hours later. He headed west to the Dakotas to try to heal his spirit, living alone for two years in a cabin he built. During that time, he killed his own food, tended to cattle and horses, and used his solitude to read during the evenings. He found the healing he sought, and he came away with a love for a land that already was being hunted, deforested and abused. He returned to New York in 1886 and embarked on a political career, becoming vice president and then president when William McKinley was assassinated in 1901. Gifford Pinchot’s family had made a fortune, ironically, through logging. His grandfather had become wealthy by providing the timber and fuel necessary to build America. His father had never gotten his hands dirty in the family business and, in fact, encouraged Pinchot to study forestry, a discipline almost unknown in the States. Pinchot took his father’s suggestion to heart, earning his degree at Yale and then traveling to Europe to gain more first-hand experience with experienced foresters. His European mentors expressed great interest in the western U.S. When Pinchot came home, he made his own pilgrimage to the West and became a disciple of John Muir, a naturalist and founder of the Sierra Club. Pinchot and Roosevelt knew each other from sportsmen’s circles in New York. They fed each other’s adrenaline rushes, often engaging in wrestling and boxing matches. They shared an interest in the Great Outdoors, and they teamed up to designate millions of acres of land as national forests. It wasn’t an easy task, however. They faced strong opposition from timber companies we still know today – Potlatch, Weyerhaeuser and others. Their biggest foe was William Clark, a powerful Montana businessman and a senator from the Big Sky Country. 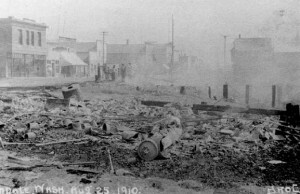 Roosevelt and Pinchot probably would not have prevailed except for the Katrina-like disaster of their day – a fearsome forest fire in 1910 that spread across the states of Washington, Idaho and Montana and covered 3 million acres, an area the size of Connecticut. Roosevelt and Pinchot used the fire to help make their case that forests needed protection. Congress had nearly starved the Roosevelt-Pinchot creation, the U.S. Forest Service, into extinction before the fire. Afterward, however, the nation rallied behind them. As a result, we and our descendants can enjoy the beauty of these public lands. To learn more about the fire and the politics behind the national forests, read Timothy Egan’s book, The Big Burn. It’s a quick read, and it will help you see that so many of the issues we’re engaged in today endure from generation to generation. Some may never be resolved, but in every age, we agree to fight over them because they’re worth debating, discussing and trying to solve. This entry was posted in Politics, Society and tagged Gifford Pinchot, National Forest Service, The Big Burn, Theodore Roosevelt, Timothy Egan. Bookmark the permalink.